Signals initiated by the IL7R are required for B cell development. However, the roles that distinct IL7R-induced signaling pathways play in this process remains unclear. To identify the function of the Raf and STAT5 pathways in IL7R-dependent B cell development, we used transgenic mice that express constitutively active forms of Raf (Raf-CAAX) or STAT5 (STAT5b-CA) throughout lymphocyte development. Both Raf-CAAX and STAT5b-CA mice exhibit large increases in pro-B cells. However, crossing the Raf-CAAX transgene onto the IL7R−/− background fails to rescue B cell development. In contrast, STAT5 activation selectively restores B cell expansion in IL7R−/− mice. Notably, the expansion of pro-B cells in STAT5b-CA mice correlated with an increase in cyclin D2, pim-1, and bcl-xL expression, suggesting that STAT5 directly affects pro-B cell proliferation and survival. In addition, STAT5 activation also restored B cell differentiation in IL7R−/− mice as determined by 1) the restoration of VH Ig gene rearrangement and 2) the appearance of immature and mature B cell subsets. These findings establish STAT5 as the key player entraining B cell development downstream of the IL7R. Early lymphocyte development is critically dependent on signals mediated through the IL7R. The IL7R is expressed on common lymphoid progenitor cells, which reside in the bone marrow and give rise to B lymphocytes and NK cells (1). Numerous studies indicate that deficiency of the IL7R or IL7 itself leads to an early block in both B and T cell development (2, 3). Specifically, B cell differentiation in IL7R−/− mice is abrogated at the pro-B cell stage (before Hardy fraction B), resulting in an almost complete elimination of pre-B, immature, and mature B cells (2, 3). Thus, the IL7R regulates both early murine lymphocyte differentiation and proliferation. The IL7R also plays a key role in regulating gene rearrangement at the Ig H chain locus (4, 5, 6). For example, studies by Corcoran et al. (4) show that in IL7R−/− mice, recombination of VH gene segments is impaired as their distance increases upstream of the D/J gene cluster. Numerous VH gene families are present in the H chain locus, but two that are representative of D/J distal and D/J proximal genes include the VHJ558 and VH7183 families, respectively. In wild-type mice, the VH repertoire is biased toward the VHJ558 family (7). In contrast, mice deficient for the IL7R lack rearrangements involving the VHJ558 gene family and show predominant VH7183 gene usage (4). Subsequent studies by Chowdhury and Sen (5, 8) have demonstrated that the IL7R regulates histone acetylation and chromatin accessibility of D/J distal VH gene families. This has led to the conclusion that the IL7R regulates H chain gene recombination by altering accessibility of this locus to the recombination-activating gene recombinases. Although the IL7R plays a key role in governing early lymphocyte development, the downstream signaling pathways that entrain this process remain poorly characterized. Previous studies have shown that IL7 signaling leads to activation of the phosphatidylinositol-3-kinase (PI3K)3 pathway, the Ras/Raf signaling cascade, and Janus kinase/STAT pathways (STAT5 and STAT3) (9, 10, 11). Phosphorylation of the IL7Rα chain on Y449 has been shown to be required for activation of PI3K and STAT5 (9, 11). Furthermore, studies using Y449F IL7R mutants in Witte-Whitlock culture models of B cell differentiation have suggested that this residue is important for IL7-dependent pro-B cell proliferation, but not differentiation. This result was attributed to an effect on PI3K but not STAT5 signaling (12). However, mice lacking either the p85 or p110 subunits of PI3K do not show alterations in pro-B cell development (13, 14). In contrast, mice deficient in STAT5a and STAT5b (STAT5a/b−/−) show clear reductions in pro-B cells (15, 16). Hence, the relative roles of these two signaling pathways in IL7R signaling need to be more clearly defined. Finally, studies by Iritani et al. (17) have shown that mice expressing a dnRas transgene in lymphocytes exhibit a very early developmental block at the pre-pro B cell stage, which parallels that observed in IL7R−/− mice. However, the link between the Ras/Raf/extracellular signal-regulated kinase (Erk) pathway and the IL7R remains controversial. Studies by Crawley et al. (18) concluded that IL7 does not induce activation of the Ras/Raf/Erk pathway in murine T cell lines. In contrast, more recent results from Fleming and Paige (10) have shown that IL7 transiently induces the Erk pathway in pre-B cells. Thus, the role of the Ras/Raf pathway in IL7R-dependent B cell development also needs further characterization. To identify the role that these pathways play in IL7R-dependent lymphocyte development, we used transgenic mice expressing constitutively active forms of Raf (Raf-CAAX) or STAT5 (STAT5b-CA). Both Raf-CAAX- and STAT5b-CA-transgenic mice show increased percentages of pro-B cells. However, expression of the Raf-CAAX transgene failed to rescue IL7-dependent developmental defects. In contrast, crossing STAT5b-CA mice to IL7R−/− mice significantly rescued B cell differentiation, proliferation, and Ig gene rearrangement. These results demonstrate that STAT5 activation is the key mechanism by which the IL7R regulates early B cell development. Raf-CAAX-transgenic mice have been previously described (17). STAT5b-CA mice were generated using standard procedures. A constitutively active version of STAT5 was created by introducing two point mutations: His299 → Arg and Ser711 → Phe (19). Expression of this transgene is restricted to T and B lymphocytes by a compound promoter/enhancer cassette consisting of the lck proximal promoter and the Eμ enhancer (17). STAT5a/b−/− mice were obtained from J. Ihle (St. Jude Children’s Research Hospital, Memphis, TN). Mice deficient for the IL7R were obtained from The Jackson Laboratory (Bar Harbor, ME). All mice used for analysis were between 4 and 10 wk old. All mice used were backcrossed to the C57BL/6 background for at least 10 generations; the exception is STAT5a/b−/− mice which are on a mixed 129 × C57BL/6 background. Mice were housed in specific pathogen-free facilities at the University of Minnesota; all animal experiments were approved by the University of Minnesota Institutional Animal Care and Use Committee. Bone marrow (two tibia and two femurs per mouse) and spleens were isolated and processed as previously described (17). RBC were removed from the spleen and bone marrow samples by ammonium chloride lysis. Cells were then stained with a panel of Abs (listed below) and analyzed on either a FACSCalibur, a FACSVantage DiVa, or a FACSAria (BD Biosciences, Mountain View, CA). Abs directed against the following markers were obtained from eBioscience (San Diego, CA). CD3 (2C11), CD4 (GK1.5), CD8 (53-6.7), CD11b (M1/70), CD16/32 (93), CD23 (B3B4), CD24 (M1/69), B220 (RA3-6B2), CD117 (2B8), BP-1 (FG35.4), Gr-1 (RB6-8C5), IgM (1B4B1), and TER119. Additional Abs directed against the following cell surface markers were obtained from BD PharMingen (San Diego, CA): CD19 (MB19-1), CD21 (7G6), and CD43 (S7). 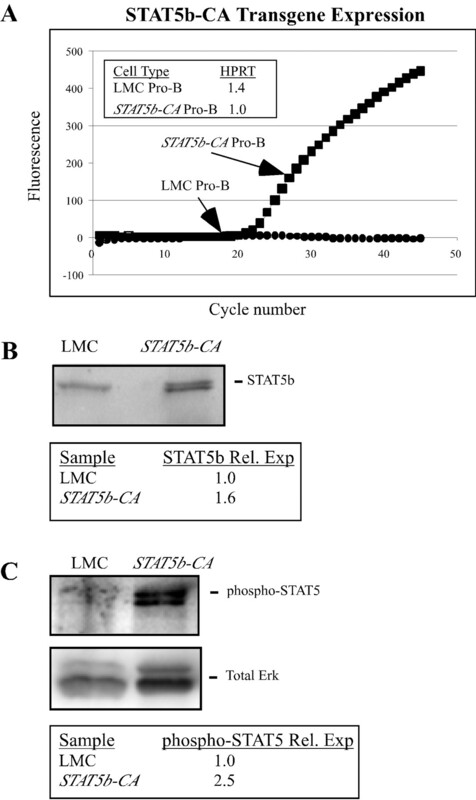 Bone marrow from littermate control (LMC) and STAT5b-CA mice was isolated and processed as previously described (20). Both fraction B and fraction C B cells were isolated using five-color flow cytometry. Lineage-negative (Lin−) cells were removed via magnetic depletion using an AutoMACS and Abs directed against CD3, CD4, CD8, CD11b, Gr-1, and TER119 (Lin+). Lin− cells were then stained with B220 and CD43 to isolate pro-B cells and further subdivided into fraction A, fraction B, and fraction C pro-B cells by using Abs against BP-1 and CD19. Both fraction B (CD19+BP-1−) and fraction C (CD19+BP-1+) pro-B cells were sorted on a FACSAria; the purity of the sorted populations was ≥95%. Total pro-B cells were isolated by first removing non-B lineage cells via magnetic depletion using an AutoMACS and Abs directed against CD3, CD11b, Gr-1, and TER119. The depleted cell populations were then stained with B220 and IgM and sorted on a FACSVantage DiVa to isolate pro-B cells (B220lowIgM−); the purity of sorted populations was ≥96%. RNA was prepared from sorted populations using an RNeasy kit (Qiagen, Valencia, CA). A two-step procedure was then conducted for real-time PCR assays. First, RNA was converted to cDNA using Invitrogen’s RT-PCR Reagent kit (Carlsbad, CA). Aliquots of cDNA were then used in real-time PCR assays using a Cepheid Smartcycler. Reactions for HPRT, bcl-xL, cyclin D2 and the STAT5b-CA transgene were conducted for 1 cycle at 95°C for 2 min followed by 45 cycles at 60°C (50 s) and 95°C (15 s). Similar conditions were used for pim-1 except the annealing/extension temperature was 64°C. Serial dilutions of RNA were used to establish standard curves and permitted quantitation of relative levels of RNA expression. With the exception of hypoxanthine ribosyltransferase (HPRT) and cyclin D2 (see below), the oligonucleotides and TaqMan probes used for RT-PCR have been previously described (20). All oligonucleotides and TaqMan probes were obtained from IDT (Coralville, IA): 5′ HPRT primer, CTTTCCCTGGTTAAGCAGTACA; 3′ HPRT primer, GCCTGTATCCAACACTTCGA; HPRT probe, Cy5-TTGCAAGCTTGCTGGTGAAAAGGABHQ2; 5′ Cyclin D2, GCACATCCTTCGCAAGC; 3′ cyclin D2, TGCAATCATCGACGGC; and cyclin D2 probe, 6-FAM-ATCGCTCTGTGCGCTACCGACTT-BHQ1. Pro-B cells were purified, as described above, from LMC, STAT5b-CA, STAT5b-CAxIL7R−/−, and IL7R−/− mice. Genomic DNA was isolated using a DNeasy tissue kit (Qiagen). Genomic DNA from LMC, STAT5b-CA, STAT5b-CAxIL7R−/−, and IL7R−/− mice was normalized by absolute cell numbers. PCR assays to examine VHJ558 and VH7183 gene usage have been previously described (4, 21). Briefly, a two-step PCR is conducted to examine VH gene usage. The first PCR contains 5′ primers for VHJ558 and VH7183 and a 3′ primer for JH4. Aliquots from the first PCR served as templates for the second PCR. Second-step PCR contained 5′ VHJ558 or VH7183 primers, respectively, with a nested 3′ JH4 primer. Serial dilutions of PCR products from the second PCR were titrated 2-fold, fractionated on a 1% agarose gel, and transferred to a nylon membrane (Amersham Pharmacia Biotech, Piscataway, NJ). An oligonucleotide for an internal JH1 probe was end-labeled with [γ-32P]ATP as previously described (22). Southern blots were conducted according to the manufacturer’s instructions (Amersham Pharmacia Biotech) and scanned on a STORM phosphor imager (Amersham Pharmacia Biotech). PCR to amplify the HPRT gene were conducted to normalize for amounts of input genomic DNA. The primers used for the HPRT reaction have been previously described (20). The HPRT PCR consisted of 25 cycles of the following three steps: 95°C for 15 s, 60°C for 50 s, and 72°C for 30 s. The PCR products were then titrated 2-fold as described above, fractionated on a 1% agarose gel, and visualized by ethidium bromide staining. An oligonucleotide for the HPRT probe was end-labeled with [γ-32P]ATP as previously described (22) and the Southern blot was conducted as described above. Bone marrow and spleens were isolated from LMC and STATb-CA mice and processed as previously described (20). CD19+IgM− bone marrow cells or B220+ splenocytes were purified on an AutoMACS. The purified cells were then resuspended in cell lysis buffer (23) for 10 min and centrifuged for 5 min at 14,000 rpm to remove cell nuclei and debris. The cell lysates were then resuspended in 5× Laemmli buffer, fractionated on a 10% SDS-polyacrylamide gel, and then transferred to polyvinylidene difluoride membranes. Immunoblotting for total STAT5, phospho-STAT5, and total Erk was conducted as previously described (20, 23). Similar experiments were conducted to assay Bcl-xL expression levels using a rabbit polyclonal anti-Bcl-xL antisera (kindly provided by Dr. A. Kelekar, University of Minnesota, Minneapolis, MN) in conjunction with an anti-rabbit secondary Ab conjugated to alkaline phosphatase (Amersham Pharmacia Biotech). To study the role that the Raf and STAT5 signaling pathways play in IL7R signaling, we used transgenic mice expressing constitutively active forms of Raf (Raf-CAAX) or STAT5 (STAT5b-CA). Expression of these transgenes was regulated by a compound promoter consisting of the lck proximal promoter and the Eμ enhancer (17). The Raf-CAAX-transgenic mice have been previously described (17). Briefly, a CAAX motif derived from K-Ras, which contains a polybasic region and farnesylation signal, was fused to the C-terminal domain of human c-Raf-1. This results in localization of Raf to the plasma membrane and hence constitutive Raf activation (24, 25). Previous studies have documented that the Raf-CAAX transgene is expressed throughout B and T cell development (17, 22). Similarly, recent work has demonstrated that STAT5 can be rendered constitutively active by introducing point mutations at His299 (H299R) and Ser711 (S711F). This results in constitutive phosphorylation of Tyr699 (Y699), thereby activating STAT5 (19). Based on these results, we generated transgenic mice expressing a constitutively active form of STAT5b (20). Expression of the STAT5b-CA transgene was verified using real-time RT-PCR. STAT5b-CA transgene expression was detected in B220+CD43+ pro- and pre-B cells (Fig. 1⇓A) as well as fraction B and fraction C pro-B cells (data not shown). Similar amounts of RNA were used in these experiments as demonstrated by normalization to HPRTmRNA levels (Fig. 1⇓A, inset). To determine the relative level of STAT5b-CA expression in bone marrow B cells, we conducted Western blots using an Ab to STAT5 that detects both endogenous and transgenic-derived STAT5 protein. As seen in Fig. 1⇓B, total STAT5 expression was only increased 1.6-fold, indicating that the STAT5b-CA transgene does not result in a large increase in total STAT5 expression. Although the presence of activated STAT5 can be monitored using Abs that recognize STAT5 phosphorylated on Y699, we were unable to obtain sufficient numbers of cells from fraction B or fraction C pro-B cells to carry out such immunoblotting experiments. However, we have previously documented that the STAT5b-CA transgene continues to be expressed in more mature B and T cell populations (20). As shown in Fig. 1⇓C, freshly isolated mature B cells from STAT5b-CA mice express 2.5-fold more phospho-STAT5 than those isolated from littermate control mice. Thus, STAT5b-CA expression strongly correlates with activation of the STAT5 signaling pathway. Relative expression of the STAT5b-CA transgene. Bone marrow from STAT5b-CA and LMC mice was harvested and processed as described in Materials and Methods. A, Fraction B (CD19+BP-1−), fraction C (CD19+BP-1+), and pro-B cells (B220+IgM−) were isolated by flow cytometry. STAT5b-CA mRNA expression was quantitated using a TaqMan RT-PCR assay. No signal was detected in reactions lacking reverse transcriptase (data not shown). Relative expression values were obtained after normalization using a HPRT TaqMan assay; results shown are representative of five experiments. B, Western blotting of lysates from CD19+IgM− sorted pro-B cells. Western blotting was conducted to assay for total STAT5b protein expression. To normalize for loading differences between samples, the blot was stripped and reprobed for total Erk (data not shown). Relative STATb protein expression was then calculated by dividing STATb expression by that of total Erk expression. C, Spleens from LMC and STATb-CA mice were isolated and harvested as described in Materials and Methods. B220+ splenic B cells were purified from LMC and STAT5b-CA mice via positive selection on the AutoMACS. Whole-cell lysates were isolated from the purified cell populations, and Western blotting was conducted to assay for phospho-STAT5 protein expression. Blots were normalized as in B. Previous studies have shown that the Ras/Raf/Mek/Erk pathway is crucial for early B cell development (17). Therefore, we further characterized Raf-CAAX-transgenic mice to examine what effect constitutive Raf activation had on B cell development. As shown in Fig. 2⇓, Raf-CAAX mice show a significant increase in the percentage of pro-B cells that express CD19 relative to LMC mice (86.6% vs 23.4%, Fig. 2⇓, A and B); similar results were reported by Iritani et al. (117) using heat-stable Ag as a marker for B220+CD43+ pro-B cells. We then calculated absolute numbers of pro-B, immature B, and mature B cells. Although total numbers of B lineage cells are slightly reduced in Raf-CAAX compared with LMC mice, CD43+CD19+ pro-B cells exhibit a 3.0-fold increase in total cell numbers (Table I⇓). Given that Raf activation promotes pro-B cell expansion, we examined whether it could rescue B cell development in IL7R−/− mice. As shown in Fig. 2⇓, crossing the Raf-CAAX transgene onto the IL7R−/− background failed to restore normal B cell development. Specifically, we observed no increase in immature B or mature B cells in Raf-CAAXxIL7R−/− mice relative to IL7R−/− mice (Fig. 2⇓C). Furthermore, the number and percentage of B220+CD43+CD19+ pro-B cells are also similar to those observed in IL7R−/− mice, indicating that early B cell development is not restored (Fig. 2⇓B and Table II⇓). Thus, despite Raf-CAAX’s effects on pro-B cell expansion, Raf activation is not sufficient to rescue early B cell development in IL7R−/− mice. 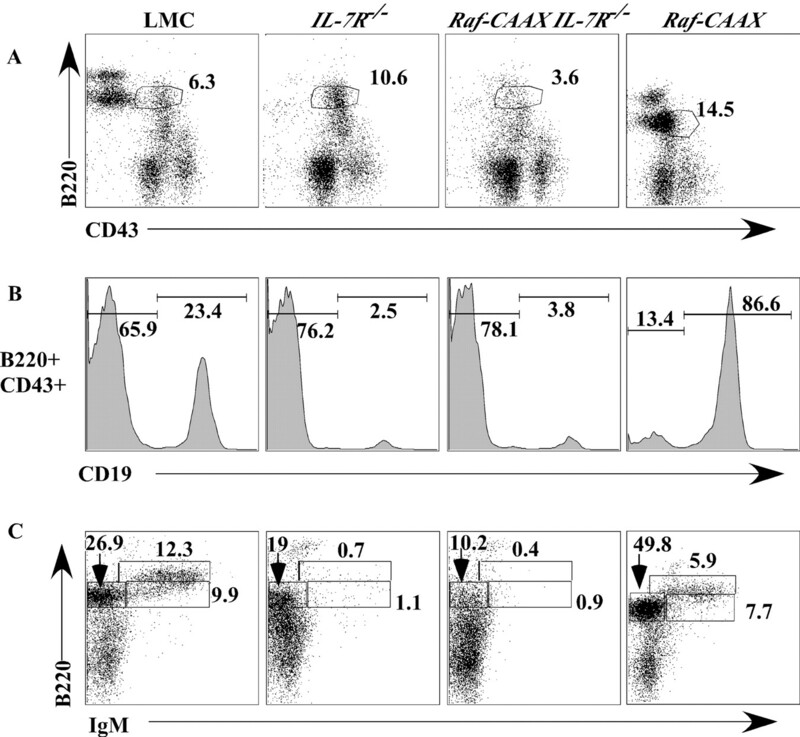 Raf-CAAX expression fails to rescue IL7R-dependent B cell development. Bone marrow cells from 6- to 8-wk-old mice were used to analyze B cell development. A, In all experiments, non-B lineage cells were electronically gated out using markers for CD11b, Gr-1, TER119, and CD3. The pro-B cell population (see gate) was identified by costaining with Abs for B220 and CD43. B, B220+CD43+ pro-B cells were further classified as CD19− pre-pro-B cells (Hardy fraction A) and CD19+ pro-B cells (Hardy fractions B/C). C, Bone marrow cells were stained using Abs directed against B220 and IgM to identify pro- and pre-B cells (B220lowIgM−), immature B cells (B220lowIgM+), and mature B cells (B220highIgM+). 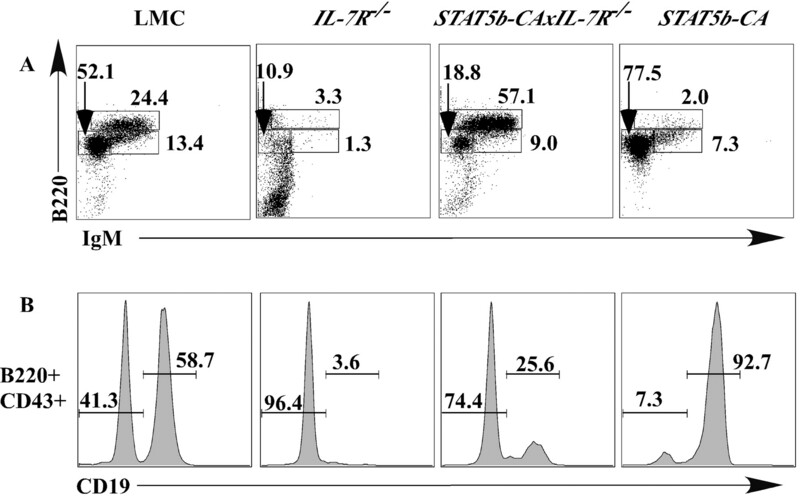 These results are representative of ≥6 LMC, Raf-CAAXxIL7R−/−, and IL7R−/− mice. Previous studies have documented that STAT5a/b−/− mice exhibit an ∼3-fold reduction in pro-B and pre-B cell populations (15, 16). We further characterized these mice using five-color flow cytometry to more closely characterize the pro-B cell subsets (Hardy fractions A–C). Since the typical B220+CD43+ flow cytometry gate used to identify pro-B cells frequently contains contaminating non-B lineage cells, we removed those cells by electronically gating out Gr-1+, CD11b+, TER119+, and CD3+ cells (Lin+ cells). Lin− B220+CD43+ pro-B cells were then further subdivided into pre-pro-B (CD19−, BP-1−, Hardy fraction A), early pro-B (CD19+, BP-1−, Hardy fraction B), and late pro-B cells (CD19+BP-1+, Hardy fraction C) using the cell surface markers CD19 and BP-1 (Fig. 3⇓). Consistent with previous reports, we observed a 2-fold reduction in total numbers of pro- and pre-B cells in STAT5a/b−/− mice (data not shown). However, as seen in Fig. 3⇓, late pro-B cells were much more dramatically reduced in STAT5a/b−/− mice relative to LMC (0.6% vs 5.8%, respectively). Thus, STAT5 plays an especially important role in the development of late pro-B cells. STAT5-deficient mice lack late pro-B cells. Five-color flow cytometry was used to identify Hardy fractions A–C in 4- to 6-wk-old LMC and STAT5a/b−/− mice. In all experiments, non-B lineage cells (CD11b, Gr-1, TER119, and CD3) were electronically gated out. Pro-B cells were stained with B220 and CD43 (left panel). 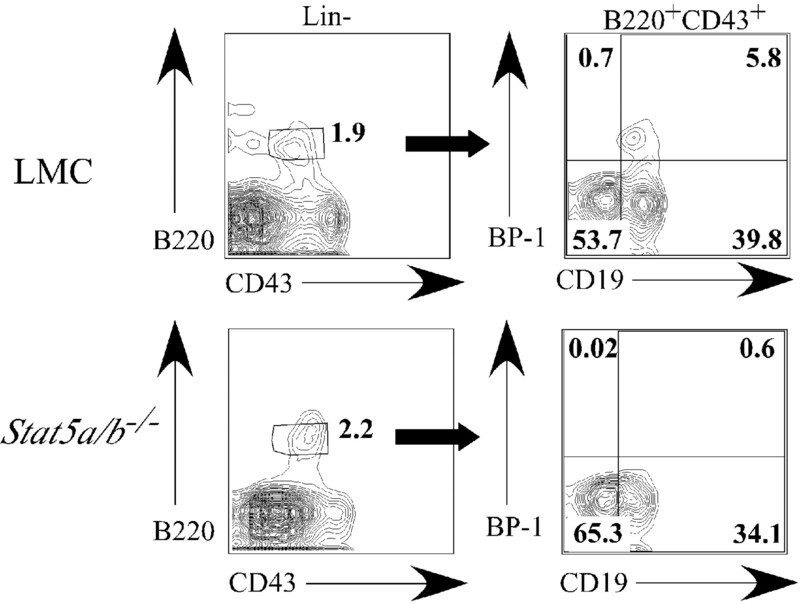 B220+CD43+ pro-B cells were further subdivided into Hardy fractions A–C using markers for CD19 and BP-1 (right panel). These results are representative of three experiments. Given the large decrease observed in late pro-B cells in STAT5a/b−/− mice, we proceeded to examine the effect of constitutive STAT5 activation on B cell development. As seen in Fig. 4⇓A, B220+IgM− pro-B and pre-B cells are greatly increased in the bone marrow of STAT5b-CA mice. Likewise, we observed a dramatic increase in CD43+CD19+ pro-B cells in STAT5b-CA mice (Fig. 4⇓B). Specifically, we observed a 5-fold increase in pro-B cells and a 3.3-fold increase in immature B cells (Table I⇑). Finally, we noted that fraction A cells (fraction A contains a mix of pre-pro-B cells as well as other lineage progenitor cell types (26)) were relatively unchanged in number, but early pro-B and late pro-B cells were increased 2.8- and 13.5-fold, respectively (Table I⇑). In contrast, mature B cell numbers were not significantly changed relative to LMC mice. Thus, STAT5 activation predominantly drives expansion of developing B cells in the bone marrow, but does not perturb mature B cell homeostasis. STAT5b activation enhances pro-B cell development in STAT5b-CA-transgenic mice and rescues B cell development in IL7R-deficient mice. Bone marrow cells from 6- to 8-wk-old mice were used to analyze B cell development. In all experiments, non-B lineage cells were electronically gated out from total bone marrow cells using markers for CD11b, Gr-1, TER119, and CD3 (Lin+). A, Pro- and pre-B cells (B220lowIgM−), immature B cells (B220lowIgM+), and mature B cells (B220highIgM+) were identified as in Fig. 2⇑. B, B220+CD43+ pro-B cells were further classified as CD19− pre-pro-B cells (Hardy fraction A) and CD19+ pro-B cells (Hardy fraction B/C). These results are representative of three experiments (two mice per group per experiment). IL7R−/− mice lack virtually all immature B and mature B cell populations and show dramatic reductions in the percentage of pro-B and pre-B cells (Fig. 4⇑, A and B, and Table II⇑). Crossing the STAT5b-CA transgene onto the IL7R−/− background restored immature B and mature B cell populations as seen by significant increases in the percentage of immature B (9% vs 1%) and mature B cells (57% vs 3%, Fig. 4⇑A). Furthermore, as shown in Table II⇑, absolute numbers of immature and mature B cells are increased 5.6- and 28.8-fold, respectively. Since IL7R−/− mice show a severe block in the differentiation of cells to the CD43+CD19+ pro-B cell stage, we also examined pro-B cell development. As shown in Fig. 4⇑B, IL7R−/− mice exhibit a drastic decline in the percentage and number of pro-B cells (17× ↓ relative to LMC). In contrast, the presence of the STAT5b-CA transgene rescued pro-B cell populations (Fig. 4⇑C), resulting in a 5.9-fold increase in CD43+CD19+ pro-B cells (Table II⇑). Thus, these results establish that STAT5 activation is sufficient to drive IL7-dependent B cell differentiation. In addition, they demonstrate that IL7-dependent pro-B cell expansion is largely dependent upon STAT5 activation as well. Although STAT5 activation clearly restores B cell differentiation in IL7R−/− mice, it remained possible that IL7R-dependent Ig gene rearrangement remained defective. Previous studies have reported that IL7R−/− mice show highly skewed VH gene usage. D/J distal gene families, which typically are the predominant VH genes observed to be rearranged in mature B cells, are not detected; rather the relatively underutilized D/J proximal VH7183 gene family is the predominant one that is rearranged in IL7R−/− pro-B cells (4). Based on these studies, we examined VH gene usage in sorted pro-B cells from LMC, IL7R−/−, STAT5b-CA, and STAT5b-CAxIL7R−/− mice. These sorted pro-B cell populations were used to prepare genomic DNA and a semiquantitative PCR assay was then used that allowed us to examine relative VH gene usage (4, 21). Two different VH gene families were examined, VH7183 and VHJ558, which represent D/J proximal and D/J distal gene families, respectively (Fig. 5⇓A). Following PCR amplification the PCR products were fractionated by agarose gel electrophoresis, transferred to nylon membranes, and then blotted with an internal JH probe. As shown in Fig. 5⇓B and consistent with previous reports (7), LMC pro-B cells predominantly exhibit Ig gene rearrangements involving the VHJ558 gene family. Conversely, IL7R−/− pro-B cells did not show any detectable rearrangement to the VHJ558 family; instead, they exclusively exhibited rearrangements involving members of the VH7183 gene family (Fig. 5⇓B). In contrast, although STAT5b-CAx IL7R−/− mice revealed low levels of VH7183 gene usage, VHJ558 gene usage was clearly restored to levels that approached those seen in wild-type mice (Fig. 5⇓B). Importantly, the pattern of VH gene usage in STAT5b-CA pro-B cells was similar to that observed in LMC mice (Fig. 5⇓D). This result indicates that the presence of the STAT5b-CA transgene does not alter VH gene usage in mice with a functional IL7R. The HPRT gene served as a control to verify that equivalent amounts of genomic DNA were used in each experiment (Fig. 5⇓, B–D). These results indicate that STAT5 activation not only affects B cell expansion in IL7R−/− mice, but restores Ig gene rearrangement and hence pro-B cell differentiation as well. STAT5 activation rescues Ig gene rearrangement in IL7R−/− mice. A, Schematic diagram of the VDJ gene cluster. The VHJ558 gene family is representative of distal D/J families, whereas the VH7183 family is representative of proximal D/J families. The arrows indicate the relative position of the PCR primers used. The internal JH probe is indicated by a solid line. B, LMC, STAT5b-CAxIL7R−/−, and IL7R−/− mice (6–8 wk old) were used to examine VH gene usage. Pro-B cells (Lin−B220+IgM−) from each of these mice were isolated via FACS (purity >96%). Genomic DNA was then isolated from these cells and used in a semiquantitative PCR assay to examine VHJ558 and VH7183 gene usage. The PCR products were fractionated on a 1% agarose gel, transferred to a nylon membrane, and blotted with an internal JH probe. Two-fold dilutions were used to titrate the PCR products from each reaction. A water control was used to verify that there was no DNA contamination of our reagents. C, HPRT served as a loading control to normalize for differences in the amount of input genomic DNA. Genomic DNA from each sample was amplified using a HPRT PCR. The PCR products were then fractionated on a 1% agarose gel and stained with ethidium bromide. These results are representative of three experiments. D, Upper panel: Pro-B cells (Lin−B220+IgM−) from LMC and STATb-CA mice were isolated via FACS (purity >97%). Genomic DNA was isolated from these cells, and the PCR assays/Southern blots used to examine VHJ558 and VH7183 gene usage were conducted as described in B. Lower panel, HPRT served as a loading control as described in C. The HPRT PCR products were fractionated on a 1% agarose gel, transferred to a nylon membrane, and blotted with a HPRT probe. Two-fold dilutions were used to titrate the PCR products from each reaction. These results are representative of two experiments (three LMC and STAT5b-CA mice per experiment). Although IL7R−/− mice have a severe block in B cell development, they are not devoid of mature B cells. However, virtually all B cells in adult IL7R−/− mice are marginal zone (MZ) B cells while follicular (FO) B cells are almost undetectable (27). Therefore, we examined peripheral B cell development in STAT5b-CAxIL-7R−/− mice to determine whether FO B cell numbers were also restored. Splenocytes from LMC, IL7R−/−, and STAT5b-CAx IL7R−/− mice were harvested and analyzed by flow cytometry using Abs to the cell surface markers B220, CD23, and CD21. This strategy allowed us to identify B220+CD23highCD21low FO B cells and B220+CD23lowCD21high MZ B cells (28). As indicated in Table II⇑ and consistent with previous reports, we observed a 34.7-fold reduction in FO B cells in IL-7R−/− mice. MZ B cells were also decreased in IL7R−/− mice (8.3× ↓), although to a much lesser extent. In contrast, STAT5b-CAx IL7R−/− mice showed a 15.7-fold increase in total B220+ cells in the spleen relative to IL7R−/− mice (Table II⇑). Furthermore, FO and MZ B cell numbers were increased 17.8- and 10.1-fold, respectively (Table II⇑). Thus, the presence of the STAT5b-CA transgene in IL7R−/− mice not only rescues early B cell development but also largely restores normal splenic B cell populations. To determine the mechanism by which STAT5 activation drives IL7R-dependent pro-B cell development, we examined the expression of cyclin D2, pim-1, and bcl-xL in pro-B cells from STAT5b-CA and LMC mice. For these experiments, we sorted fraction B and fraction C pro-B cells by flow cytometry (≥95% pure populations after sorting) and then harvested RNA for use in quantitative real-time PCR experiments. As shown in Fig. 6⇓A, cyclin D2 expression was increased 4.9- and 6.5-fold in fraction B and fraction C pro-B cells, respectively. Pim-1 mRNA levels were also increased in fraction B pro-B cells (2.1-fold), although expression was only marginally higher in fraction C pro-B cells (Fig. 6⇓B). Finally, bcl-xL mRNA levels were increased 2-fold in fraction B and fraction C pro-B cells from STAT5b-CA mice; similarly, Bcl-xL protein levels were increased 3-fold in CD19+ pro-B cells from STAT5b-CA mice (Fig. 6⇓C). Thus, STAT5 activation in pro-B cells leads to the induction of genes involved in regulating cell proliferation (cyclin D2 and pim-1) as well as cell survival (bcl-xL). STAT5 up-regulates cyclin D2, pim-1, and bcl-xL in pro-B cell populations. Bone marrow from STAT5b-CA and LMC mice was harvested and processed as described in Materials and Methods. A and B, Fraction B (CD19+BP-1−) and fraction C (CD19+BP-1+) pro-B cells were isolated by flow cytometry. Cyclin D2 and pim-1 mRNA expression was quantitated using TaqMan RT-PCR assays. No signal was detected in reactions lacking reverse transcriptase (data not shown). Relative expression values were obtained after normalization using a HPRT TaqMan assay. Results shown are representative of four experiments. C, CD19+IgM− pro-B cells from LMC and STATb-CA mice were purified using an AutoMACS. Whole-cell lysates were isolated from the purified cell populations, and Western blotting was conducted to assay for Bcl-xL protein expression. To normalize for loading differences between samples, the blot was stripped and reprobed for total Erk expression. Relative Bcl-xL protein expression was then calculated by dividing Bcl-xL expression by that of total Erk expression. The IL7R activates several downstream signaling pathways including those involving 1) PI3K/Akt, 2) Ras/Raf, and 3) Jak/STAT (STAT5, STAT3). However, the biological effects induced by these distinct signaling pathways with regard to IL7R-dependent B cell development have not been clearly elucidated. Herein, we report that ectopic activation of STAT5 restores B cell differentiation and Ig gene rearrangement in IL7R−/− mice. B cell expansion is also dramatically increased relative to IL7R−/− mice (6-fold↑ and 29-fold↑ in pro-B and mature B cells, respectively). Importantly, the effect of STAT5 activation does not result from pro-B cell expansion alone, since expression of an activated Raf transgene, which also increases pro-B cell numbers in C57BL/6 mice, does not rescue B cell differentiation when crossed onto the IL7R−/− background. Thus, these studies establish that activation of the STAT5 signaling pathway is sufficient to recapitulate virtually all aspects of adult B cell development in IL7R−/− mice. A key question that remains is the identification of STAT5 target genes involved in this process. A number of genes that have been implicated in regulating cell proliferation, such as cyclin D2 and pim-1, have been reported to be induced by STAT5. Likewise, several survival genes such as bcl-xL have been shown to be regulated by STAT5 in vitro as well (29, 30). Notably, we observed that cyclin D2, pim-1, and bcl-xL are up-regulated in pro-B cells from STAT5b-CA mice (Fig. 6⇑); this suggests that STAT5 effects on pro-B cell expansion are mediated in part via induction of these genes. The potential mechanisms by which STAT5 affects pro-B cell differentiation and Ig gene rearrangement are less apparent. Interestingly, STAT5 has been shown to bind to specific target sequences within the TCR-γ locus. This results in altered chromatin structure, including increased histone acetylation at the TCR-γ locus, thereby promoting TCR-γ gene rearrangement (31). Thus, an intriguing possibility is that STAT5 may directly regulate the chromatin structure of the Ig H chain gene locus as well. Alternatively, STAT5 may act indirectly by inducing other transcription factors involved in B cell development. One particularly attractive candidate is pax5, a transcription factor that is also required for early B cell development (32) and Ig gene rearrangement (6). Supporting this hypothesis, recent work by Hirokawa et al. (33) has established that STAT5 binds to a specific site within the pax5 promoter and directly promotes pax5 transcription (33). Hence, STAT5-dependent pax5 transcription most likely plays an important role in regulating IL7-dependent B cell development. STAT5 activation is sufficient to induce most of the IL7R’s effects on B cell development. Therefore, the role of other signaling pathways downstream of the IL7R remains unclear. Given the similar developmental blocks observed in dnRas and IL7R−/− mice, we had initially hypothesized that the Ras/Raf pathway might play an important role in regulating IL7R-dependent B cell development. However, our studies with Raf-CAAXxIL7R−/− mice did not provide evidence supporting this hypothesis. Taken together with the paucity of evidence implicating a role for the IL7R in robust Ras activation, it is probable that the Ras/Raf pathway plays a more important role downstream of other receptors involved in early B cell development such as flk2/flt3, c-kit, or CXCR4 (34, 35). However, it remains possible that IL7R-dependent Raf activation may play a more prominent role in later stages of B cell development (i.e., immature and mature B cells). As opposed to the Ras/Raf cascade, substantial evidence exists to support a role for the PI3K pathway in IL7R signaling. For example, previous studies by Corcoran et al. have documented a role for PI3K in IL7R-dependent pro-B cell expansion (12). Their experimental system involved reconstitution of IL7R−/− fetal liver stem cells with either wild-type or mutant (Y449F) IL7Rs. Pro-B cell expansion and differentiation was then assessed following transfer of these IL7R-reconstituted stem cells into Witte-Whitlock bone marrow cultures. Based on these studies, they concluded that IL7R-dependent pro-B cell expansion requires PI3K activity. In contrast, they suggested that IL7R-dependent pro-B cell differentiation did not require PI3K or STAT5 induction. These effects of PI3K on pro-B cell proliferation are potentially consistent with our findings. Specifically, although there is a dramatic increase in pro-B cells in STAT5b-CAxIL7R−/− relative to IL7R−/− mice, this rescue is incomplete as pro-B and mature B cell numbers remain reduced 3- and 4-fold, respectively, relative to that of wild-type mice (Table II⇑). Thus, it is likely that synergy between the PI3K and STAT5 signaling pathways may be required for complete reconstitution of pro-B cell expansion in IL7R−/− mice. In contrast to the results of Corcoran et al. (4) on pro-B cell differentiation and Ig gene rearrangement, our findings clearly support a role for STAT5 activation in these processes. We believe there are several potential reasons for these differences. The simplest explanation is that these discrepancies may result from differences in B cell development in vivo vs in Witte-Whitlock cultures. An alternative explanation is that this may simply reflect differences in fetal B cell development (examined using fetal liver stem cells in Corcoran’s system) and adult B cell differentiation (examined in STAT5b-CA mice) (36). This is of particular concern since IL7R deficiency has been reported to primarily block adult but not fetal B cell development (27). However, because the studies by Corcoran et al. (4) did not directly demonstrate that STAT5 activation is not involved in B cell differentiation, we believe the most likely explanation is that STAT5 activation actually is required in both systems. Specifically, their conclusions relied on two distinct experiments. First, they showed that IL7R mutants (Y449F), which should not activate STAT5, were still capable of promoting pro-B cell differentiation. Second, they demonstrated that substituting the cytoplasmic domain of the IL2R for that of the IL7R did not promote pro-B cell differentiation, despite the fact that this cytoplasmic domain should lead to STAT5 activation. Based on these experiments, they proposed that STAT5 activation is neither necessary nor sufficient for B cell differentiation. There are two potential problems with this interpretation. First, these studies did not specifically document that STAT5 activation was not induced in Y449F reconstituted cells. This is of particular concern since retroviral infection may result in overexpression of the IL-7R Y449F mutant, potentially allowing STAT5 activation via alternative, nonphysiologic phosphotyrosine docking sites on the Y449F mutant IL7R. Second, STAT5 activation was also not examined in cells reconstituted with IL7R/IL2R chimeric constructs. Along these lines, it is possible that the IL2R may result in greater activation of STAT5 inhibitors than the IL7R. This would result in the selective attenuation of STAT5 signaling following IL2- but not IL7-dependent receptor signaling. Recent reports from Cornish et al. (37) strongly support this hypothesis. They demonstrate that suppressor of cytokine signaling 1 (SOCS-1) (which is induced by both IL-2 and IL-7) dramatically inhibits IL-2-dependent STAT5 activation in T cells. IL-7-dependent STAT5 activation is also affected by SOCS-1, but to a much lesser degree, indicating that IL7 can be a more potent activator of the STAT5 pathway (37). Thus, we believe that the studies by Corcoran et al. (4) do not conclusively rule out a role for STAT5 activation in pro-B cell differentiation. Although our results demonstrate that STAT5 activation is sufficient to reconstitute B cell development in IL7R−/− mice, in vivo evidence documenting the necessity of STAT5 activation in this process is less clear. For example, although we have demonstrated that STAT5a/b−/− mice exhibit a substantial decrease in late pro-B cells, it is clear that B lymphopoiesis is not compromised to the same extent as seen in IL7R−/− mice. One possible reason for this finding is that the related transcription factor, STAT3, which is also activated upon IL7R signaling, may partially compensate for loss of STAT5. Previous studies have shown that STAT3 deficiency results in embryonic lethality (38) and studies of B cells conditionally lacking STAT3 have not yet been reported. Thus, addressing this possibility will ultimately require generating B cells deficient in both STAT3 and STAT5. An alternative explanation for the different phenotypes observed in IL7R−/− and STAT5a/b−/− mice may be due to the fact that the IL7Rα chain is required for signaling via two distinct cytokines, namely, IL7 and thymic stromal lymphopoietin (TSLP). We believe our results predominately reflect an effect of STAT5 downstream of IL7. Specifically, STAT5b-CA expression closely mimics many of the effects of IL7 overexpression, including expansion of B cell populations (39). Similarly, IL7−/− mice show a later block in B cell development (at fraction B → fraction C) than IL7R−/− mice (fraction A → fraction B) (3). Interestingly, the IL7-dependent developmental block more closely resembles that seen in STAT5a/b−/− mice. In contrast, TSLP overexpression in adult mice results in an expansion of myeloid cell progenitors and diminished B and T lymphopoiesis (40). Furthermore, although TSLP promotes the growth of fetal pro-B cells, it has no effect on adult pro-B cell expansion, indicating that adult pro-B cells are not responsive to this cytokine (41). Taken together, these results strongly suggest that STAT5 activation plays a key role in directing IL7- and IL7R-dependent B cell differentiation in adult mice. We thank Drs. James Ihle and David Largaespada for providing STAT5a/b−/− mice, Dr. Ameeta Kelekar for providing anti-Bcl-xL Abs, and Greg Veltri for assistance with flow cytometry. We also thank Drs. Tim Behrens, Kris Hogquist, and Tucker LeBien for critical review of this manuscript. ↵1 This work was supported by grants to M.A.F. from the National Institutes of Health (AI05737), the Concern Foundation, and the Minnesota Medical Foundation and by a Pew Scholar Award (to M.A.F.). C.A.G. and M.A.B. were partially supported by a gift from the estate of Eli and Dorothy Rosen and Bernard Collins. C.A.G. was also supported by a National Institutes of Health Training Grant (2T32-AI07313). ↵3 Abbreviations used in this paper: PI3K, phosphatidylinositol 3-kinase; LMC, littermate control; HPRT, hypoxanthine ribosyltransferase; Lin, lineage; MZ, marginal zone; FO, follicular; SOCS-1, suppresser of cytokine signaling 1; TSLP, thymic stromal lymphopoietin; Erk, extracellular signal-regulated kinase. Kondo, M., I. L. Weissman, K. Akashi. 1997. Identification of clonogenic common lymphoid progenitors in mouse bone marrow. Cell 91:661. Peschon, J. J., P. J. Morrissey, K. I. Grabstein, F. J. Ramsdell, E. Maraskovsky, B. C. Gliniak, L. S. Park, S. F. Ziegler, D. E. Williams, C. B. Ware, et al 1994. Early lymphocyte expansion is severely impaired in interleukin-7 receptor deficient mice. J. Exp. Med. 180:1955.
von Freeden-Jeffry, U., P. Vieira, L. A. Lucian, T. McNeil, S. E. G. Burdach, R. Murray. 1995. Lymphopenia in interleukin (IL)-7 gene-deleted mice identifies IL-7 as a nonredundant cytokine. J. Exp. Med. 181:1519. Corcoran, A. E., A. Riddell, D. Krooshoop, A. R. Venkitaraman. 1998. Impaired immunoglobulin gene rearrangement in mice lacking the IL-7 receptor. Nature 391:904. Chowdhury, D., R. Sen. 2001. Stepwise activation of the immunoglobulin mu heavy chain gene locus. EMBO J. 20:6394.
ten Boekel, E., F. Melchers, A. G. Rolink. 1997. Changes in the VH gene repertoire of developing precursor B lymphocytes in mouse bone marrow mediated by the pre-B cell receptor. Immunity 7:357. Chowdhury, D., R. Sen. 2003. Transient IL-7/IL-7R signaling provides a mechanism for feedback inhibition of immunoglobulin heavy chain gene rearrangements. Immunity 18:229. Fleming, H. E., C. J. Paige. 2001. Pre-B cell receptor signaling mediates selective response to IL-7 at the pro-B to pre-B cell transition via an ERK/MAP kinase-dependent pathway. Immunity 15:521. Lin, J.-X., T.-S. Migone, M. Tsang, M. Friedmann, J. A. Weatherbee, L. Zhou, A. Yamauchi, E. T. Bloom, J. Mietz, S. John, W. J. Leonard. 1995. The role of shared receptor motifs and common stat proteins in the generation of cytokine pleiotropy and redundancy by IL-2, IL-4, IL-7, IL-13, and IL-15. Immunity 2:331. Corcoran, A. E., F. M. Smart, R. J. Cowling, T. Crompton, M. J. Owen, A. R. Venkitaraman. 1996. The interleukin-7 receptor α chain transmits distinct signals for proliferation and differentiation during B lymphopoiesis. EMBO J. 15:1924. Fruman, D. A., S. B. Snapper, C. M. Yballe, L. Davidson, J. Y. Yu, F. W. Alt, L. C. Cantley. 1999. Impaired B cell development and proliferation in absence of phosphoinositide 3-kinase p85α. Science 283:393. Clayton, E., G. Bardi, S. E. Bell, D. Chantry, C. P. Downes, A. Gray, L. A. Humphries, D. Rawlings, H. Reynolds, E. Vigorito, M. Turner. 2002. A crucial role for the p110δ subunit of phosphatidylinositol 3-kinase in B cell development and activation. J. Exp. Med. 196:753. Sexl, V., R. Piekorz, R. Moriggl, J. Rohrer, M. P. Brown, K. D. Bunting, K. Rothammer, M. F. Roussel, J. N. Ihle. 2000. Stat5a/b contribute to interleukin 7-induced B-cell precursor expansion, but abl- and bcr/abl-induced transformation are independent of Stat5. Blood 96:2277. Iritani, B. M., K. A. Forbush, M. A. Farrar, R. M. Perlmutter. 1997. Control of B cell development by Ras-mediated activation of Raf. EMBO J. 16:7019. Burchill, M. A., C. A. Goetz, M. Prlic, J. J. O’Neil, I. R. Harmon, S. J. Bensinger, L. A. Turka, P. Brennan, S. C. Jameson, M. A. Farrar. 2003. Distinct effects of STAT5 activation on CD4+ and CD8+ T cell homeostasis: development of CD4+CD25+ regulatory T cells versus CD8+ memory T cells. J. Immunol. 171:5853.
ten Boekel, E., F. Melchers, A. Rolink. 1995. The status of Ig loci rearrangements in single cells from different stages of B cell development. Int. Immunol. 7:1013. Iritani, B. M., J. Alberola-Ila, K. A. Forbush, R. M. Perimutter. 1999. Distinct signals mediate maturation and allelic exclusion in lymphocyte progenitors. Immunity 10:713. Goetz, C. A., J. J. O’Neil, M. A. Farrar. 2003. Membrane localization, oligomerization, and phosphorylation are required for optimal raf activation. J. Biol. Chem. 278:51184. Stokoe, D., S. G. Macdonald, K. Cadwallader, M. Symons, J. F. Hancock. 1994. Activation of Raf as a result of recruitment to the plasma membrane. Science 264:1463. Leevers, S. J., H. F. Paterson, C. J. Marshall. 1994. Requirement for Ras in Raf activation is overcome by targeting Raf to the plasma membrane. Nature 369:411. Tudor, K. S., K. J. Payne, Y. Yamashita, P. W. Kincade. 2000. Functional assessment of precursors from murine bone marrow suggests a sequence of early B lineage differentiation events. Immunity 12:335. Carvalho, T. L., T. Mota-Santos, A. Cumano, J. Demengeot, P. Vieira. 2001. Arrested B lymphopoiesis and persistence of activated B cells in adult interleukin 7−/− mice. J. Exp. Med. 194:1141. Cariappa, A., S. Pillai. 2002. Antigen-dependent B-cell development. Curr. Opin. Immunol. 14:241. Ye, S. K., Y. Agata, H. C. Lee, H. Kurooka, T. Kitamura, A. Shimizu, T. Honjo, K. Ikuta. 2001. 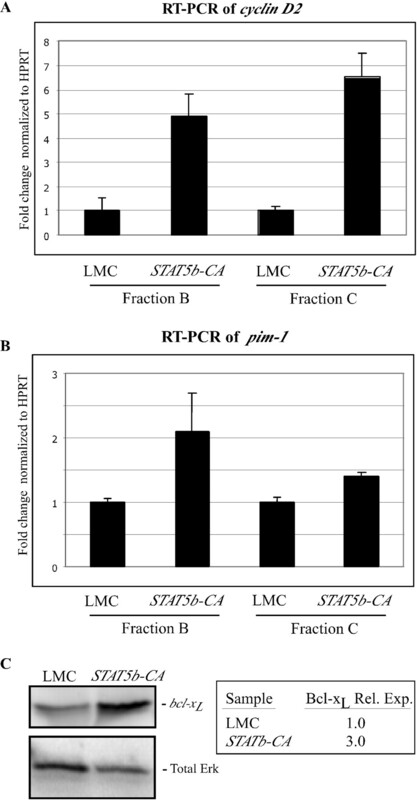 The IL-7 receptor controls the accessibility of the TCRγ locus by Stat5 and histone acetylation. Immunity 15:813. Hirokawa, S., H. Sato, I. Kato, A. Kudo. 2003. EBF-regulating Pax5 transcription is enhanced by STAT5 in the early stage of B cells. Eur. J. Immunol. 33:1824. Mackarehtschian, K., J. D. Hardin, K. A. Moore, S. Boast, S. P. Goff, I. R. Lemischka. 1995. Targeted disruption of the flk2/flt3 gene leads to deficiencies in primitive hematopoietic progenitors. Immunity. 3:147. Zou, Y. R., A. H. Kottmann, M. Kuroda, I. Taniuchi, D. R. Littman. 1998. Function of the chemokine receptor CXCR4 in haematopoiesis and in cerebellar development. Nature 393:595. Kincade, P. W., J. J. Owen, H. Igarashi, T. Kouro, T. Yokota, M. I. Rossi. 2002. Nature or nurture? Steady-state lymphocyte formation in adults does not recapitulate ontogeny. Immunol. Rev. 187:116. Cornish, A. L., M. M. Chong, G. M. Davey, R. Darwiche, N. A. Nicola, D. J. Hilton, T. W. Kay, R. Starr, W. S. Alexander. 2003. Suppressor of cytokine signaling-1 regulates signaling in response to interleukin-2 and other γc-dependent cytokines in peripheral T cells. J. Biol. Chem. 278:22755. Takeda, K., K. Noguchi, W. Shi, T. Tanaka, M. Matsumoto, N. Yoshida, T. Kishimoto, S. Akira. 1997. Targeted disruption of the mouse Stat3 gene leads to early embryonic lethality. Proc. Natl. Acad. Sci. USA 94:3801. Rich, B. E., J. Campos-Torres, R. I. Tepper, R. W. Moreadith, P. Leder. 1993. Cutaneous lymphoproliferation and lymphomas in interleukin 7 transgenic mice. J. Exp. Med. 177:305. Osborn, M. J., P. L. Ryan, N. Kirchhof, A. Panoskaltsis-Mortari, F. Mortari, K. S. Tudor. 2004. Overexpression of murine TSLP impairs lymphopoiesis and myelopoiesis. Blood 103:843. Vosshenrich, C. A., A. Cumano, W. Muller, J. P. Di Santo, P. Vieira. 2003. Thymus stromal-derived lymphopoietin distinguishes fetal from adult B cell development. Nat. Immunol. 4:773.